bUniversity of California, San Francisco (E.C.D. ), San Francisco, California. BACKGROUND: Image-guided biopsy is routinely conducted in patients with suspected discitis, though the sensitivity reported in the literature ranges widely. PURPOSE: We applied a systematic review and meta-analysis to estimate the yield of image-guided biopsy for infectious discitis. DATA SOURCES: We performed a literature search of 4 data bases: PubMed, Cochrane CENTRAL Register of Controlled Trials, Embase.com, and Scopus from data base inception to March 2016. STUDY SELECTION: A screen of 1814 articles identified 88 potentially relevant articles. Data were extracted for 33 articles, which were eligible if they were peer-reviewed publications of patients with clinical suspicion of discitis who underwent image-guided biopsy. DATA ANALYSIS: Patients with positive cultures out of total image-guided biopsy procedures were pooled to estimate yield with 95% confidence intervals. Hypothesis testing was performed with an inverse variance method after logit transformation. DATA SYNTHESIS: Image-guided biopsy has a yield of approximately 48% (793/1763), which is significantly lower than the open surgical biopsy yield of 76% (152/201; P < .01). Biopsy in patients with prior antibiotic exposure had a yield of 32% (106/346), which was not significantly different from the yield of 43% (336/813; P = .08) in patients without prior antibiotic exposure. LIMITATIONS: The conclusions of this meta-analysis are primarily limited by the heterogeneity of the included studies. CONCLUSIONS: Image-guided biopsy has a moderate yield for the diagnosis of infectious discitis, which is significantly lower than the yield of open surgical biopsy. This yield is not significantly affected by prior antibiotic use. Given the broad range of reported sensitivity in the literature, the current study aimed to evaluate the literature with regard to the yield of image-guided biopsy in suspected cases of discitis. We performed a systematic review of image-guided biopsy in suspected cases of discitis. 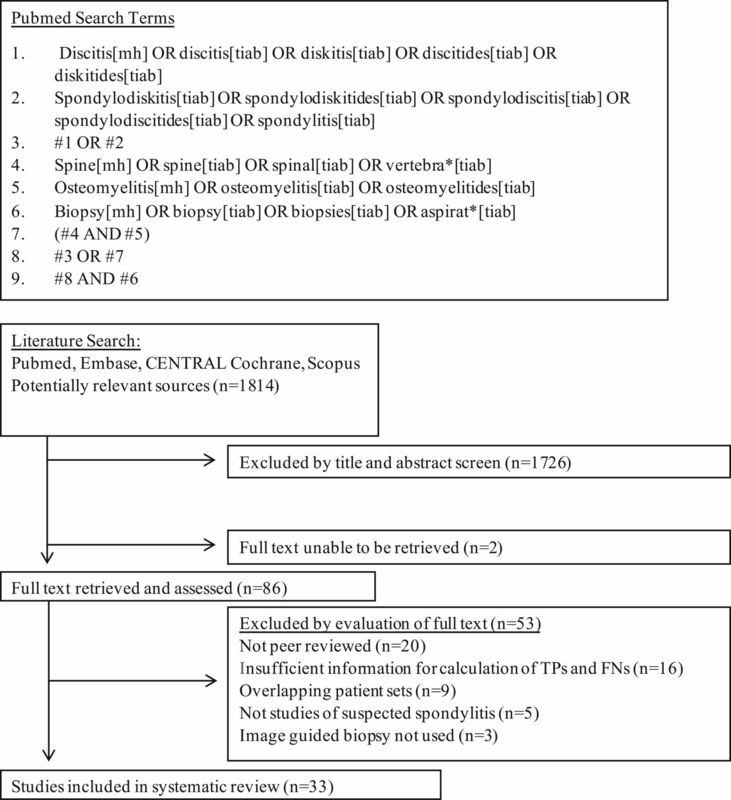 We identified 1 other systematic review and meta-analysis on this topic, performed by Pupaibool et al,15 which found the sensitivity of CT-guided biopsy to be 52.2%, though this meta-analysis did not consider cases of discitis with prior surgical intervention (a common and clinically important indication for image-guided biopsy), did not assess many subgroups, and evaluated only 358 abstracts as opposed to the 1814 abstracts we identified as potentially relevant. In our study, the studies were compared in a meta-analysis of sensitivity, as well as the following subgroup analyses: open surgical versus image-guided biopsy, prior antibiotic exposure, type of image guidance, biopsy technique, pathogen detected, and pathogen detection technique (polymerase chain reaction versus culture). A review protocol was designed according to PRISMA guidelines and registered with the PROSPERO register (ID CRD42016039121). Eligible studies were peer-reviewed journal articles containing empiric data on the yield of image-guided biopsy in discitis. The inclusion criteria were as follows: a) peer-reviewed journal publication on human patients; b) patients were clinically suspected of having infectious discitis before biopsy; c) biopsy samples were obtained via CT- or fluoroscopic-guided procedure; and d) reported data necessary to extract true-positive and false-negative biopsy culture results. An experienced reference librarian assisted with designing the search strategy. The search strategy was designed with synonyms identified through index searching with MeSH. The following electronic data bases were searched: PubMed, Cochrane CENTRAL Register of Controlled Trials, Embase.com, and Scopus. The search was open to articles from data base inception to March 3, 2016 and was not restricted to the English language. An example of the search structure used in PubMed is illustrated in Fig 1. PubMed search structure and search flow diagram. Mh indicates Medical Subject Heading; tiab, Title and Abstract; TP, true-positive; FN, false-negative. The title/abstract screening was completed independently by 2 reviewers with DistillerSR (Evidence Partners, Cambridge, United Kingdom). Disagreements were resolved by consensus discussion between the 2 reviewers. Non-English literature was translated with Google Translate (Google, Mountain View, California). The full-text articles of relevant references were acquired and independently reviewed for inclusion. Disagreements were resolved by consensus discussion by the 2 reviewers. Data were collected from the full text of the eligible studies by 1 reviewer. Extracted data included the publication year and number of patients, true-positives, true-negatives, false-positives, and false-negatives. Where possible, values were also recorded for the following factors potentially contributing to study heterogeneity: biopsy performed with a large-bore cutting or core needle versus fine needle aspiration, use of CT or fluoroscopic guidance for biopsy, antibiotic use before biopsy, type of pathogen responsible for discitis (pyogenic versus mycobacterial pathogen), and use of surgical biopsy when reported in the same paper. In cases of overlapping patient sets between separate publications, the most recent series was selected and included in the systematic review and meta-analysis. Statistical analysis was performed in R 3.3.0 (http://www.r-project.org/) by using the “metaprop” and “forest” functions of the “meta” package,17 which generated confidence intervals of the proportion of true-positives (yield) as well as hypothesis testing with an inverse variance method after logit transformation. 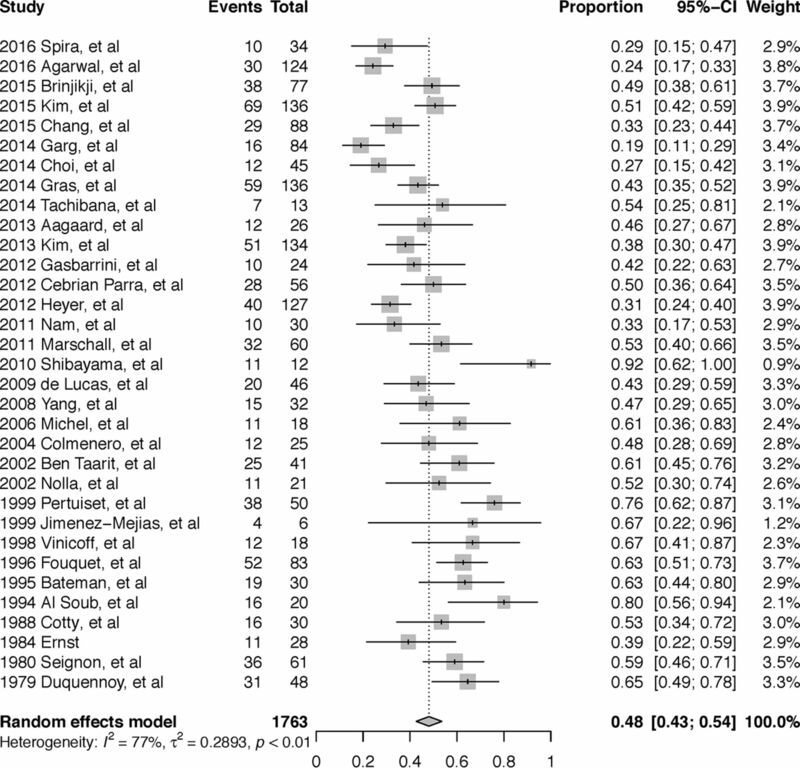 Results reported in this paper represent random-effects models of meta-analysis. Estimates of yield were produced with 95% confidence intervals. Values of P < .05 were regarded as significant. The search results are shown in Fig 1. The literature search identified 1814 articles. An initial screen of the titles and abstracts identified 88 potentially relevant articles. Eighty-six of the relevant articles were obtainable, and 2 articles were unobtainable through our institution's resources or interlibrary loan. The 86 full-text relevant articles were reviewed for eligibility, and 33 articles satisfied all of the inclusion criteria. Reasons for exclusion of the 53 references are included in Fig 1. Data were extracted for 33 articles found to be eligible for inclusion in the systematic review and meta-analysis. The individual study characteristics are presented in the Table. In total, there were 1763 image-guided biopsies with attempted culture for inclusion within the systematic review. The reference test for the diagnosis of discitis was established by a variety of methods across the studies: as an adjunct to clinical characteristics (which was used in all included studies); 13/33 (39%) used a mix of CT and MR imaging; 8/33 (24%) used MR imaging; 3/33 (9%) used histopathology; and 9/33 (27%) did not clearly define the specific imaging or other diagnostic tests. Few studies confirmed the use of coaxial guidance (8/33 [24%]), whereas most did not report specifically on coaxial versus noncoaxial technique. The QUADAS-2 results of each individual study is represented in On-line Fig 1. The assessment showed that most studies had a low risk of bias with regard to flow and timing, index test, and patient selection, as shown in On-line Fig 2. Studies that required or included a positive biopsy culture, the index test, as a criterion for the diagnosis of discitis were considered to have a high risk of bias with respect to the reference standard. Studies that did not thoroughly describe the factors contributing to the diagnosis of discitis were considered to have an uncertain risk of bias regarding the reference standard. With regard to the selection of patients, studies that excluded postoperative discitis or patients with epidural abscesses were considered to have a high risk of bias. Studies that did not fully describe the methods of patient selection were considered to have an uncertain risk of bias with regard to patient selection. Yield was calculated by using the true-positive data and false-negative data from each study. All but 2 studies did not report data for true-negatives and false-positives.18,19 In each of those studies, false-positive results were classified based on the growth of common contaminants without concurrent growth in blood cultures. The pooled yield of the 33 studies included in the meta-analysis was 48% (793/1763 patients; 95% CI, 0.43–0.54 [Fig 2]). There were multiple sources of heterogeneity within the studies, including surgical biopsy, antibiotic exposure, CT or fluoroscopic guidance, large-bore and/or cutting needle biopsy versus fine needle aspiration, pyogenic versus mycobacterium tuberculosis, and polymerase chain reaction versus culture. Forest plot of overall yield of image-guided biopsy. Eight studies included data from open surgical biopsy specimens, and the yield within this subgroup was significantly higher than image guided biopsy at 76% (152/201; 95% CI, 0.65–0.85; P < .01 [Fig 3]). 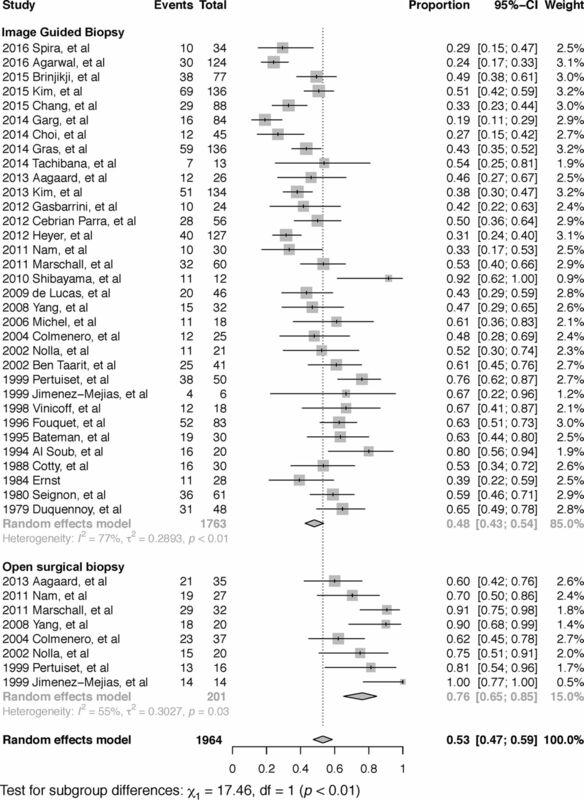 Forest plot of subgroup analysis of the yield of image-guided biopsy versus open surgical biopsy. Twelve studies included patients with confirmed antibiotic exposure before image-guided biopsy, and 17 studies included patients with confirmed absence of antibiotic exposure before image-guided biopsy. Image-guided biopsy in patients without prior antibiotic exposure produced a higher yield at 43% (336/813; 95% CI, 0.37–0.48; P = .08) compared with 32% (106/346; 95% CI, 0.22–0.43) in the group with prior antibiotic exposure, though this was not statistically significant (On-line Fig 3). Fourteen studies specified the number of biopsies performed under CT guidance, and 6 studies specified the number of biopsies performed under fluoroscopic guidance. All other studies either did not break down results by method or did not specify the method of image guidance. Fluoroscopic guidance was associated with a higher yield at 55% (158/316; 95% CI 0.40–0.69) compared with CT guidance at 44% (275/693; 95% CI, 0.36–0.53; P = .22), though this was not statistically significant (On-line Fig 4). Seventeen studies specified the use of cutting or core needle biopsy (large bore) or fine needle aspiration, with 13 studies using large-bore biopsy and 4 studies using fine needle aspiration. Fine needle aspiration was associated with a significantly higher yield at 60% (98/167; 95% CI, 0.45–0.73) compared with large-bore needle biopsy at 41% (304/821; 95% CI, 0.33–0.49; P = .03 [On-line Fig 5]). Seventeen studies reported data specific for pyogenic pathogen detection, and 7 studies reported data specific for mycobacterium tuberculosis detection. Image-guided biopsy had a significantly higher yield in the detection of mycobacterium tuberculosis at 71% (97/132; 95% CI, 0.54–0.84) compared with detection of pyogenic organisms at 48% (331/738; 95% CI, 0.41–0.56; P = .02 [On-line Fig 6]). Two studies reported results for polymerase chain reaction detection of pathogen. There was no significant difference between the yield of polymerase chain reaction at 50% (30/60; 95% CI, 0.38–0.63) and culture at 48% (793/1763; 95% CI, 0.43–0.54; P = .46 [On-line Fig 7]). At most institutions, image-guided biopsy is routinely conducted in patients with suspected discitis because it is considered important to identify the target microorganism before appropriate therapy can be administered. We undertook this meta-analysis to estimate the yield of image-guided biopsy and to better understand the factors that influence the yield of image-guided biopsy. Our comprehensive meta-analysis demonstrates that image guided biopsy has a moderate yield of 48% (95% CI, 0.43–0.54) for the diagnosis of infectious discitis, providing a more useful assessment of this diagnostic tool than the broad range of 31% to 91% that has been reported in the literature.8,9 This yield is lower than open surgical biopsy (yield of 76%), consistent with other reports in the literature.11,12 Prior antibiotic treatment causes a decrease in the yield of image-guided biopsy (43% without prior antibiotics versus 32% with prior antibiotic exposure), though this effect was statistically insignificant in this study. The decision to provide antibiotics before obtaining a positive culture result is a complex clinical decision that must weigh diagnostic certainty and decisive antibiotic selection against the benefits of early therapy. Although this meta-analysis suggests fluoroscopy-guided biopsy had a higher yield of 55% compared with 44% for CT-guided biopsy, this difference did not reach statistical significance. The reasons for this are not clear. Intuitively, CT should provide better identification of the exact biopsy location compared with fluoroscopy. Most of the studies did not provide information regarding the location of biopsy (central versus peripheral) in all of the patients. This result may reflect the heterogeneity of confounding factors in the source studies (changing use of CT versus fluoroscopic guidance, etc). Alternatively, fluoroscopically guided biopsies may have had the needle placed more centrally than CT-guided biopsies; this could have provided more reassurance to the fluoroscopic operators that the needle was indeed within the disc compared with the CT operators, who may have stopped when the needle entered the peripheral disc because they were certain of the needle position. There were several other sources of heterogeneity within the studies, suggesting other predictors of yield. Fine needle aspiration was associated with a higher yield of 60% compared with large-bore needle biopsy at 41%. This is also counterintuitive, though fine needle aspiration may be used more frequently in cases of abscesses, which may yield a sample more likely to grow in culture. There were many studies that examined the detection of mycobacterium tuberculosis through culture, which was associated with a higher yield of 71%, compared with the detection of pyogenic organisms with a yield of 48%. Lastly, there was no significant difference in the yield of polymerase chain reaction at 50% compared with culture, but this may be as a result of only a small number of cases with polymerase chain reaction (n = 60) being assessed. Most (31/33) of the examined studies considered all positive culture results from image-guided biopsies to be true-positives, essentially ignoring the possibility of false-positive results caused by factors such as surface or laboratory contamination. Two assessed studies acknowledged false-positive biopsy results. This assumption reflects the difficulty of demonstrating the responsible microorganism through reference diagnostic tests aside from direct biopsy, but may reflect a substantial error in research assessments of the performance of image-guided biopsy and many other scenarios of ongoing infectious disease research. There is 1 other meta-analysis on the yield of image-guided biopsy in discitis, performed by Pupaibool et al,15 which demonstrated a yield of 52.2%. We performed this meta-analysis because the study by Pupaibool et al15 had several limitations. Pupaibool et al15 excluded all studies of nonspontaneous discitis and included data from only 5 studies. Because spinal instrumentation and surgery are major contributors to cases of discitis and a high proportion of requests for image-guided biopsies involve patients post-instrumentation, we felt it was important to include these studies in our review and have evaluated the data from a much larger cohort of studies (n = 33).20 In addition, our study provides further diagnostic information through the subgroup analyses on the sources of heterogeneity, including open surgical biopsy, antibiotic therapy, and CT versus fluoroscopic guidance. From a methodology standpoint, our search strategy identified a higher number of potentially applicable abstracts (1814 versus 358). There are some limitations to our analysis. Like all meta-analyses, the conclusions of this meta-analysis are primarily limited by the heterogeneity of the included studies. Specifically, the studies varied in the extent to which they described their methods, including coaxial needle, prior antibiotic exposure, first or repeat biopsy, number of samples collected, and prior imaging studies. The methodology of the meta-analysis itself was limited by the inability to obtain 2 potentially relevant references for full-text review. This study indicates that image-guided biopsy in suspected discitis has a yield for detection of the infectious organism of 48%, toward the lower end of the frequently reported range of 31%–91%.3,8 Open surgical biopsy has a higher yield at 76%, and antibiotic treatment had an insignificant effect on the yield. The authors thank Mark MacEachern, who provided guidance in designing the literature search strategy. We also thank Dr. Bin Nan for assistance with statistical analysis. Abstract previously presented at: Radiological Society of North America Scientific Assembly and Annual Meeting, November 27 to December 2, 2016; Chicago, llinois. Accepted after revision June 7, 2017.